Manic Talons Nail Design: CND, Techs and Bloggers! Oh My! CND, Techs and Bloggers! Oh My! Hello Loves. So I have been MIA for a while with the move, but a lot has happened in our little (or not so little) nail world while I was away. I was planning to return with a few swatch posts next week, but current events have brought me back a little early. Grab a cup of coffee or tea...or even a beer. This is going to be a long one with no pretty pictures. But stick around. I have something pretty important to say. As some of you may know, there was recently an event in the nail world that ruffled some feathers, hurt some feelings, and has people talking. I'll do a short recap for those of you who missed it. CND partnered with Preen.me to launch a campaign that would put Shellac in front of more consumers through nail art creations. Preen.me is a vast user content network where beauty enthusiasts of all levels can share their looks, tutorials, and the like. Preen.me has a group of users in a VIP program that they rely on for campaigns such as the CND Shellac campaign. Well...somewhere things got crossed up and as best I can tell a misunderstanding occurred. CND is a Professional Only brand. According to their press release and statement, they intended for only licensed nail techs within the Preen.me community to be part of the campaign. According to the Preen.me emails to the VIP members involved, they misunderstood and relied on their usual VIP network of both licensed nail techs and non-licensed social media influencers. As a result of this misunderstanding, complete and quite impressive CND Shellac kits were sent out to non-licensed people. What happened next? Well, the industry pretty much flipped on it's head. Techs were hugely disappointed that CND sent kits via Preen.me to non-licensed people. CND published a statement in response about the misunderstanding and in the process (I assume as a result of more misunderstandings) insulted all of the non-licensed Preen.me VIPs who participated by stating that they misrepresented themselves as licensed professionals. (This was not true, by the way. All of the ones I saw are completely up front about their licensing statuses on their profiles or social media accounts.) So now you have two groups of people who are pretty ticked at CND - the techs and the bloggers. The rest of the story is unfolding now. Preen.me has not published a public statement yet that I am aware of, but they have reached out to the VIP members involved. So that's a very condensed version of what's happened. But I'm not writing this to spread the news. Nope, I have something else in mind. I could tell you what I think happened or what I think should happen, but it would be based off of speculation. Instead, I want to talk about some of the comments I have seen in various groups and the misconceptions from both sides - the techs and the bloggers. In short, I don't think the techs OR the bloggers really see the whole picture here. So I want to talk about that for a minute. Before I get to the meat of this post, I think I should first introduce myself to anyone who is visiting my little slice of the internet for the first time. I have a unique perspective on this topic, and here's why: I am a blogger (obviously). I am also a licensed nail tech. But it goes a little deeper than that. In short, I started out as a DIY gel polish user. I then turned my passion into this blog. And I later decided to turn that passion into a starvation diet. Just kidding...sorta. Anyway, I entered the DIY gel polish world when gel polish kits were just starting to hit the consumer market. I dabbled for a while, learned what I could, and then started blogging to justify my large and constantly expanding gel polish collection. This little blog took off in ways I never expected. I started doing product reviews. When life took a turn for me professionally, I decided to follow my passion into a new career. So I am a DIY, a Blogger, AND now a Licensed Nail Tech. And if you scroll back through my posts over the years, you might notice something interesting. I was reviewing professional products long before I went pro. But that's not the interesting part. Many of those products are marked as "Press Sample." What does that mean? Well, it means that the company sent them to me - a non-licensed blogger - to review. Wait a minute, techs. Don't go scrolling back just yet to see which companies to avoid. I have some things to say about that and you need to read them first. But my point in this rambling paragraph here is that I understand both sides because I LIVE BOTH SIDES. I am hoping I can help bloggers understand where the techs are coming from and help the techs understand exactly what blogging is all about. Why are Techs upset about the CND/Preen.me Campaign? So why ARE the techs so upset? I know what you're thinking. CND products are easy for you to purchase as a non-licensed person. They are all over the internet. Amazon, Ebay, even distributors will sell them to you without a second thought. So to you it seems silly for techs to be upset about something you could buy just as easily. But what you need to know is that these are diverted products. CND is a Professional Only company. They do not sell directly to the consumer and do not intend for products to be sold directly to the consumer. These listings online are there without the company's blessing. There are retail products in the CND line, but they are intended to be sold through salons. Techs look to Pro Only companies to provide products that help us do our jobs and set us apart. High quality, innovative products that you can't get at the local corner store. Sometimes these products are just higher quality versions of retail products. Sometimes they're leaps and bounds above the retail products. But they allow us to offer salon quality services. So when CND put very expensive, professional only Shellac kits in the hands of non-licensed people, techs were...well...floored. A little history of the professional side of the industry might be needed here. Not too long ago, there were a lot of companies that were professional only. For example, OPI, Essie, Harmony, IBD - these companies did not release products for the general public to purchase. Over time, that has changed. Many of these companies have started direct retail sales. OPI can be found in chain stores like Ulta and Sally Beauty Supply. Essie is in drugstores. Harmony released Gelish Mini and IBD has hard gels in Sally Beauty. The number of companies that remain Professional Only is dwindling. I could go on and on about why this change has happened, but this post is going to be long enough already. The bottom line is that CND has always been a strong supporter of the pros. Even though CND is now a division of Revlon, they have stayed true to their promise not to go direct to the consumer. So when the kits were sent to non-licensed people, techs immediately felt betrayed by a company that they have invested huge sums of money with and trusted. And we aren't just talking about money spent on product. No, we're talking about continuing education as well. That feeling of betrayal is why techs are mad. You know the rest of the story. The techs reached out to CND asking "WTF???" and CND responded. To take it a little farther, there is also concern from the techs about the reviews that started popping up as part of the program. I noticed three concerns that were voiced over and over. First, the tutorials on how to use the system were not always accurate. As techs, we spend an overwhelming amount of time countering the misinformation about the products we use. I've personally heard it all across my table and I haven't even been in a salon for that long - from how gel polish destroys your nails to how the lamps will give you cancer. It's exhausting. So that is one concern - that the people writing the reviews do not have the product education necessary to provide accurate information. The second concern was that some of the reviewers didn't even realize that CND is a Professional Only product. It was assumed by some that Shellac is a consumer product because it was included in a Preen.me VIP campaign. So rather than showing looks and colors that would drive consumers to salons for Shellac services as the campaign was intended, the reviews were viewed as encouraging consumers to purchase Shellac through diversion channels and use it themselves. Techs, I'm talking to you for a minute. I know there are people out there doing nails without licenses. You can find them on just about every online garage sales site peddling their services for stupid low prices with absolutely no training or concern for sanitation. But these are NOT the people that were involved in the Preen.me Shellac campaign. The Preen.me VIPs are a unique group of nail polish enthusiasts. They are passionate about nails - some are down right obsessed. They do their nails for the love of nails. They aren't out there doing services for anyone other than maybe their mamas. There's nothing illegal about that. At least, not here in Georgia where I'm licensed. You can polish nails all day every day without a license here as long as you don't charge for your services. But I digress. The Preen.me VIPs are bloggers, vloggers, micro-bloggers and social media influencers. So what in the heck does that even mean? Allow me to break it down in terms of the nail world. A blogger maintains a website (like this one) where she shares her opinions and her work. She might review products, show swatches, post pictorials or tutorials, or share nail art looks. Many bloggers accept press samples from companies for review. (Note that I said "press samples", not free stuff. I'll touch on that in a second). Bloggers also cross post on social media to promote their blog posts. For example, I share blog links and/or photos on Facebook, Google+, Pinterest, Instagram, Twitter, and Tumblr. I also use youtube when photos just aren't enough and video is needed. As you can imagine, I reach a lot of people that way. A vlogger is a video based blogger. They do the same thing bloggers do but via video instead of written words. Think Youtube. Micro-bloggers do the same as bloggers but on a smaller scale through limited platforms. For example, an Instagram user who posts polish swatches and nail art on that one platform might be a micro-blogger. Someone who only has a facebook page (not to be confused with a facebook profile - think business page) for sharing reviews might be a micro-blogger. Someone who only posts on micro-blogging platforms like Tumblr would also fit in this group. But the main distinction is they do some sort of review or marketing for products or nail art techniques but do not have a website like a full blogger. Social Media Influencers are consumers who share their photos and reviews with other consumers. Bloggers, vloggers and micro-bloggers are also social media influencers, but you don't have to blog to be one. You might be a soccer mom who just likes nail art and shares her work. But social media influencers usually have a large number of followers or access to a large number of people. On facebook, influencers might be members of multiple groups where they can share their thoughts with thousands of people. These influencers are usually sharing their thoughts on products they purchase themselves. Let me back up for a second and talk about press samples. Press samples are items that are sent to bloggers, vloggers and micro-bloggers for review. The bloggers (any use of the term "blogger" going forward will include vloggers and micro-bloggers) do not pay for these items. Instead, they spend hours testing, photographing, reviewing and promoting the products in exchange for the products themselves. Think of it like a trade. We trade items for exposure. Just like you might trade a nail service for a hair cut. Since it is a trade, that hair cut is certainly not free. Neither are the products we receive to review. What you might find interesting, though, is bloggers are required to claim all product received as press samples as income. Yep, we have to report it as income on our taxes. Crazy, right? So it certainly is NOT free. Aside from the time we put in, we have to pay taxes too. So that $14 bottle of gel polish that takes me 2 hours to swatch, photograph, edit, review and promote (not even minimum wage if you go by the federal rate) ends up costing me in taxes. Fun, huh? But wait, it gets better. We can't sell the products when we're done. That's a sure fire way to get blacklisted by the companies. So we get paid in product that we often never use again, have to pay taxes on it, and never see an actual dollar for it. Moving on...ok, so a lot of the bloggers out there are not licensed techs. That is true. But they don't have to be. They are not consumers either. They are journalists. Media. Op/Ed writers. But that's not saying that all bloggers are created equal. The best comparison would be to think of them as newspapers. Some bloggers are amazingly talented with HUGE reach. Think of them as the NY Times. They research the products they review. They learn about the industry. They seek knowledge and do their best to put accurate information out there. Some bloggers are, well, not the NY Times. They range from the small town paper (accurate, but not as popular) to the tabloids (so far from accurate that you might wonder what they were smoking when they wrote a review). As I said, bloggers don't have to be licensed professionals because they are media. They are not using the products on other people and they certainly aren't charging for services. They are only using them on their own hands and sharing their opinions. (No worries, techs...I'll talk about about bloggers who aren't qualified to form opinions on certain products in a minute.) Bloggers are often invited to professional only beauty shows and given media passes so they can report on the news in the industry. A lot of companies see us as media and journalists, so they send things to us to review as part of their advertising efforts. This is why several companies utilized my reach as a blogger before I became a licensed tech. Lets think of it this way: look at our beloved professional magazines. If a professional magazine has an idea for a spread, they reach out to PR companies with a theme. The PR companies then check with the brands they represent and send back samples of products. We're talking about publications for professionals, so yes, Pro Only products are sent back as press samples. Does anyone stop and ask if the editors and writers are licensed? Nope. Maybe we just assume they are, but think of all the articles that are published with incorrect information. Makes you think again, right? The truth is that many of the editors and writers for professional magazines are not licensed professionals within the topic field. They might have degrees in journalism or fashion but not a license to practice nails. They don't need a license. They are allowed to sample products and choose their favorites (the same thing bloggers do) without question. And while I'm on the topic, what happens with those press samples after an article is written? They aren't sent back to the company. And they aren't sitting around in a room full of stuff inside the magazine headquarters either. That's all I'm going to say about that. So, at this point I've talked about why techs are upset, who bloggers REALLY are, what press samples are, and why bloggers don't have to be licensed. Now let's talk about how bloggers help (not hurt) the nail industry. Let's talk about going viral. Ok techs, hopefully you see now how bloggers can promote you. They are not driving business away from you so much as driving the love and passion for nails. The people who go the DIY route do so for their own reasons. Maybe they can't afford salon services. Or maybe they just enjoy polishing their own nails and creating their own art. Whatever the reason, they are not salon clients. But blogs reach people who DO go to salons as well. My clients follow blogs. They bring in photos of nail art designs from bloggers and ask me to recreate them. I'm sure your clients do too. Blogs and bloggers can help your business. Now bloggers, it's time to talk to you for a second. You are media. While some of you might think of your blogs as just hobbies, you are still media. You know about the FTC and regulations for bloggers. You disclose your press samples and try to follow the rules. Ehhhhh...but some of you are not upholding the journalism standards. If you are going to accept a product for review, you have to do your research. You have to learn how to use the product. Professional products can cause some pretty serious side effects if not used correctly. Pro companies don't send instructions with their products because they expect you to know how to use the product if you accept it for review. Don't accept products you aren't familiar with unless you are willing to really research and learn to use the product. Now, if it's a consumer brand, that's different. Those are supposed to be easy to use and do come with instructions. If you've never used gel polish before and are offered a DIY gel polish kit, by all means accept it and review it. Consumers need to know if the system is easy to use, if the instructions are clear, and if it wears well. But if you are contacted by a pro company, know your limits. I get the desire to branch out. I do. I've done it. I reviewed acrylic systems, dip systems and even hard gels before I was fully trained. But I researched those products. I learned about them. I watched the videos. I gave them trial runs. Just about every pro brand has videos on application and removal of their products. Their educators work tirelessly producing this content. I learned about the company. Who are they? Who do they target? What is their mission? I talked to the company reps. I asked questions. I contacted a trusted nail tech who gave me guidance. Whatever the method you choose, you have to learn about the product. You are also responsible for the company's mission when you post the review. If they only sell to and through professionals, you need to make that clear. Not just for the company, but for the benefit of the reader too. You cannot write a complete review without this information. It's just not possible. If you want to be regarded as the journalist that you are, you have to research. And it is ok to say no to a sample. I turn them down all the time. Trust me...y'all do NOT want me reviewing makeup. I can't apply eye shadow to save my freaking life. So I don't review makeup. I stay within the scope of my audience as well. Please also understand that I am not saying I am the perfect blogger and never make mistakes. I do make mistakes. Constantly. I'm only sharing my insight in hopes that it will help others. My point is this: as a bloggers, we have power to influence consumers. That is a pretty big responsibility. Consumers read what we write and trust what we say. We can easily mislead them if we don't do the research. Look at it this way. Let's assume I have never eaten a coconut. A company writes to me and wants to send me a fresh coconut to review. I accept and receive the coconut, but I don't know how to crack it open or prepare it. So I take a hammer and smash it open. Let's say it tastes like dirt because it had some dirt on the outside and I didn't know to wash it first. So I form my opinion that coconut tastes like dirt and share it with my readers. Now, if my readers have never tried a coconut, they might decide not to try one because they don't like the taste of dirt either. I have now mislead the reader. It was an innocent mistake. I didn't know. But the damage is done. Someone is now convinced that coconut tastes like dirt. Of course, I can always update my post when I realize my error, but I can't guarantee that person will see that update. This is why it is crucial for us to seek the training necessary to fully review the products we use. Research, research, research!!! I can't say it enough. Or stick with what you know. Whichever works for you. But just know that we do have a responsibility to our readers as well as the brands we are reviewing (even if we purchase it ourselves) to ensure that we are publishing accurate information. I don't mean to come across as harsh. I know most of you do take your blogging responsibilities seriously. But I read some of the reviews on the Shellac kits that were posted before Preen.me pulled the campaign. And some of them were, well, far from accurate. If we expect to be respected in this industry, we can't let that happen. If we don't want to be seen as DIYers with no training and no sense who are out there spreading misinformation like wildfire, we have to put our best foot forward. We have to provide accurate and thorough reviews and be the Journalists that we are. Whew! I think I've said enough. Hopefully I've helped clear up some of the confusion from both sides. Did y'all make it to the end of this post? Did I make you mad? If I did, that's ok. Put your thoughts down in the comments and lets discuss it. Or you can email me (manictalons@yahoo.com) if you rather not discuss it publicly (or if you just want to call me names...that's cool too). Do you agree with my points? Disagree? Let's talk about it. And if I came across as a disrespectful jerk at any point in this post, I apologize. That's totally not my intention here, but I know I tend to put my foot in my mouth from time to time without realizing I'm doing it. Very well written post showing all sides of this situation. I know as I read this I thought about some of the posts I have written in the past, and if I did the product justice. I'm actually going to go back and see if I can update an old one I did to make sure it's accurate. bottom line, this post really got me thinking about who I want to be as a blogger and what I need to do to get there. Best article on this kerfuffle to date! So well done! Yay maniverse! Thanks, once again, for your leadership in communicating about issues like these involving both the consumer and professional communities. I can't describe how much I value your insights and opinions. Fantastic post! Thank you for taking the time to write this. Have a great weekend. Michelle, I've known you for a long time now and I've always valued your thoughts and opinions. This is a well thought out and very well written piece. Thank you once again. May peace reign, and we learn to support each other instead of pulling each other down. What an intelligently written, excellent article. It would look right at home in any professional publication, and I think shows both sides very well. I agree with you, in Italy we have a different point of view. Brands see PR samples as gifts and want bloggers to be grateful for the gifts and talk about it in a positive way. Some readers see us as privileged persons and are envious, we have had some harsh brand campaign versus bloggers privileges! But we do not have to pay taxes for samples! I never heard of all this because I don't use professional materials like acrylics or gel, so I have no interest in following what's going on in that world. 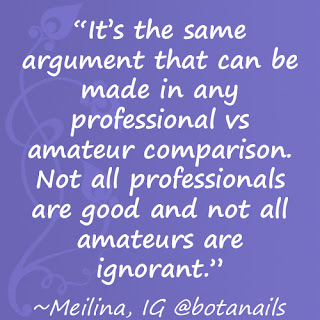 But it was a very interesting read, and Meilina of Bota Nails brings up a very good point with which I completely agree. 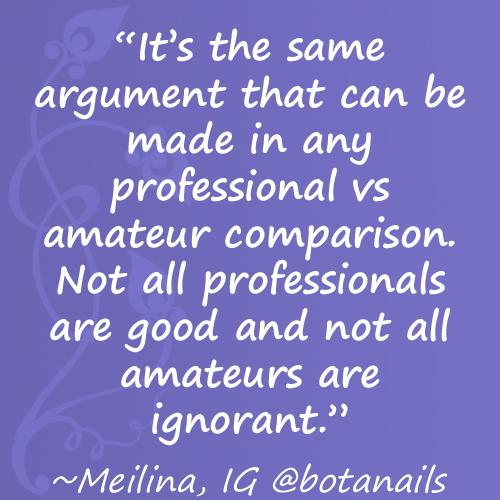 This whole argument really can be made in any type of professional vs amateur comparison. For example, quite a lot of aestheticians, cosmetologists, beauticians, and maybe even more professions do teeth whitening as an extra service. As a dentist, that used to frustrate me to no end. We spend 6+ years studying teeth, only to have someone, licensed in a completely different branch of profession, who probably does a few days/hours course of teeth whitening in their 3-4 years of education (in case it's a nail tech then even less than that), come and start offering that service in their salon. To me they are considered the amateurs who don't have the proper training and education to do a proper and safe teeth whitening, and it is going to result in their client come running in tears to the dentist to fix a (possible, maybe even permanent) damage. In the end it's exactly the same relation between a nail tech and a nail blogger. You're right, but its not the same relationship between a tech and a blogger. What you describe is the relationship between a tech and someone whonis doing nail services for others for a fee. In the case of a blogger, they are only using products on themselves. So its a little different. It would be like if I went out and purchased a professional teeth whitening kit and used it on myself at home, then told people what I think of the kit itself. That would be the tech to blogger side. Excellent article Michelle! I woke up this morning to this drama and the trail led me to your blog (which I follow anyway ;) First I thought that the lady (Nails Over Coffee) in the 30 minute rant video was overly dramatic and butthurt, then I kept reading about CND's response basically calling the participating bloggers liars (!) which really made me angry and disappointed in the brand because bloggers truly were the innocent party in this - they were approached by a platform to do a collab and nowhere as far as I'm aware they were required to be qualified techs. So to call them liars after this thing blown up is absolutely appalling! After I read your article I kind of calmed down because you presented both sides very nicely and you also reminded me my role as a blogger. But same a as you, I went from DIYer to blogger to qualified nail tech and I'm still a blogger, still qualified and I totally get what you wrote and meant. What I think is totally outrageous though is that they are actually taking the kits away from bloggers even when they already blogged and promoted this campaign! That's their payment for their services so they are being robbed! They got the kits in exchange for their time, their influence, the article, the photos and the promotion. They can't take views back, they can't make the readers unsee and unlearn the tutorials when Preen.me takes back 'the payment'. Maybe I'm sounding a bit too dramatic but that's what is feels like! It's like you did someone's nails, you got paid but 5 days later the customer comes back and demands the money back because they made a mistake and they meant to go to a different salon! Absolutely outrageous! I couldn't agree more. I tried to avoid my thoughts on how this has occurred because my post was long enough already, but I too am very disappointed in how this is playing out. This is purely speculation, but I think CND's lack of apology to the bloggers shows us how out of touch the pro companies are. I mean no disrespect to the techs out there, but it seems our professionals have managed to live inside a bubble for years. They talk to each other and learn from each other but seem to rarely look out into the consumer market. As professionals, we have to follow this market! We have to know what is trending. Our clients are consumers and follow consumer trends. 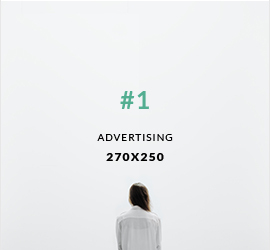 I see a lot of techs focusing in extreme shapes and 3d art, but I'm not seeing the same trend among the average client. The clients want wearable shapes and lengths with art like we see from the blogging community. This campaign had amazing possibilities. I'm surprised the bloggers haven't spoken out more about this too. Jan is supposed to address the issue on Nail Talk Radio soon (tonight, maybe? I'm not 100% sure on when) and I really hope she helps clear things up and sets it right. I know Michelle Pugh from Nails Over Coffee has published multiple apologies to the bloggers. But CND really needs to speak out as well. Michelle lit the fire, but CND delivered the real blow. They're asking for the kits back because preen.me dropped the ball and delivered them to people who shouldn't have ever had them. (By CND'S standards). It's just a real bummer that the social influencers and bloggers kind of got caught in the middle of this entire debacle. As a professional Nail Tech of over a decade, I personally love that social media has been flooded with Nails, nail art, nail shapes, nail everything. I think it's fantastic. What does hurt all of us, bloggers and Pros alike, are the people that don't know what they're doing with the product who are influencing others through social media to use the product incorrectly which then gives the impression that the product is inferior or somehow bad. To be frank, I personally I'm glad all of this happened. It's created a lot of dialogue, and let both professionals and non-professionals see the other side of the coin. Stacey, your comment posted twice so I removed the duplicate. I agree with your thoughts. This needed to happen to open channels of communication. I don't necessarily agree with how it happened and I absolutely don't agree with how the bloggers were painted as liars by the CND statement, but there is a silver lining here and that is increased understanding of both positions across the industry. I get what you're saying Stacey but 'preen.me dropping the ball' is not the bloggers' fault and if they've created and posted that content and promoted CND then they've fulfilled their obligation and the kits should stay with them. It doesn't matter if they are qualified at this point. They had an agreement with preen.me and they've done what they've promised. Do you know what I mean? *standing ovation* Well said! Wish I'd seen this last night but I read "my blogs" on bloglovin over coffee in the mornings and I'm a bit behind. Something you said on a FB post about OPI..."Most Pro Only companies fully intend for the techs to retail products into the consumer space. But that got lost somewhere along the way. Take OPI, for example. The OPI model intended for techs to sell OPI polish to their clients as a retail product. Much the same way that hair stylists retail the shampoos, conditioners and styling products they use to the clients. But the nail industry missed this point. They chose to keep the products for salon use only. As a result, it forced OPI to sell directly to the consumer themselves." That is SO RIGHT and something that so many of the techs just don't understand. Thanks so much for this post. I'm not involved beyond just being a blogger and wanting to stand by my blogger friends but I was so insulted. And I still haven't seen an apology from Nails Over Coffee. I need to bite the bullet and go look I guess. Anyway THANK YOU! Excellent post- thank you for taking the time to explain both sides! Great read Michelle. Well worth taking the time to read it. I am disappointed in how the issue was handled however. CND should have apologized to the bloggers in a respectful way and perhaps need to take a look at your post here and see HOW to handle and explain themselves when an issue happens. You have done that beautifully ! Jan Arnold issued a statement on Nail Talk Radio last night in which she apologized to the bloggers for the incorrect statement and misunderstanding. It was brief but it was there. My only thought is that I do hope she also posts something on the CND page as well. NTR doesn't reach many bloggers at all, so the apology will go unheard by the ones who need to hear it most. As a nail art DIYer, I couldn't agree more with you Michelle about the influence of bloggers! You are one of the reasons that I decided, after 3 visits to the salon, to start doing gel manicures at home. I chose Gelish because it was a branch that I could easily get instead of CND. Great article. Way to go, girl.